We chose this case for two reasons. First of all it shows the clinical power of medical massage protocols when nothing else is working. The second reason is that it complements the Case of the Month published in the last (May-June) issue of our Journal. In both cases the clients suffered from headaches and facial pain. Mr. S. Ryason, LMT and Mrs. E. Mesh, LMT used the same medical massage protocol for the Cervicalgia as a foundation for the therapy and correctly customized the further treatments by blending in the medical massage protocol for the Trigeminal Nerve Neuralgia (Mr. S. Ryason) or medical massage protocol for the Greater Occipital Nerve Neuralgia (Mrs. E. Mesh). As a result, they both were able to obtain quick and clinically stable results. Client is a 42 year-old female who works as a computer technician. In December of 2008 client went through major abdominal surgery. In January of 2009 she started to have headaches on the left side of the head. The intensity of her headaches got progressively worse. The pain medications and stretching did not help. She went to a her family physician who blocked her occipital nerves on the left side with an injection. Initially the intensity of the headaches decreased by half. In March the headaches came back with the same intensity and she started to feel pressure and later pain around the left eye. The client went to a neurologist in the Mayo clinic, and during the following month she went through intensive testing, which did not show any abnormality. The neurologist in the Mayo clinic told her that she may have leakage of cerebrospinal fluid, and she needed to have the spinal tap and contrast injected into her epidural space. The client developed severe anxiety and panic attacks. The tests did not show any leakage. The client was very depressed, discouraged and had frequent panic attacks. She was unable to work because of severe headaches on the left side. The pain is constant and she feels it starts from the back of the head and radiates to the left eye. She feels tingling and pressure around the left eye as compared to the right eye. The pain increases with rotation to either side, and it gets especially worse if she bends her head forward. 1. Trapezius levator scapula and splenius capitis muscles exhibited several active trigger points. 2. Even a light touch along the occipital ridge, especially on the left side triggered headaches which radiated to the left eye. 3. Gerstein’s point on the scalp on the top of the head was very sensitive, even during light compression. The scalp was very tense and felt stick to the cranial bones. 4. Pressure applied on the forehead especially just above the left brow worsens the headache. When I applied light pressure on both eyeballs while the eyes were closed, the client reported bright bursts accompanied by sensation of an electric shock type of pain in the left eye. I used the Medical Massage Protocol for the Greater Occipital Nerve Neuralgia. I started with client on the stomach and worked on the lower back, shoulder and neck. I use connective tissue massage strokes, and later I tried to relax the posterior cervical muscles, stretching them laterally. For the next step I used moderate friction along, and after this, across bellies of the posterior cervical muscles. After this I worked with intense friction on the insertion of the posterior cervical muscles into the occipitals. Before the client flipped over I used the scalpotherapy on the posterior surface of the head. After the client was on her back, I continued with the scalpotherapy concentrating on the areas of Gerstein’s points. The final part of the treatment in this position was work around the eyes and face. I used strokes of the connective tissue massage on the face and the protocol of the eyes treatment for the headaches. I finished the session with the client in the sitting position applying the Postisometric Muscle Relaxation on the posterior cervical muscles. Even during the treatment the client noticed a decrease in the intensity of the headache. Close to the end of the session the headaches stopped. Most of all, the client and I were impressed by the results of the eyes treatment. She did not feel any uncomfortable sensation(s) around the left eye, and told me that she sees better with her left eye and the color of the surrounding objects seems much brighter. I used the same protocol with the addition of trigger point therapy on the posterior cervical muscles. Her occipitals and areas of Gerstein’s points were much less sensitive and I was able to use more intense friction and compressions. The client did not have any headaches for five days since the last session. The treatment consisted of the same protocol but I substituted connective tissue massage strokes on the posterior neck with the periostal massage on the occipitals and upper medial corner of the scapula. I repeated the third session protocol. I gave the client ten days off to test the results of the therapy. 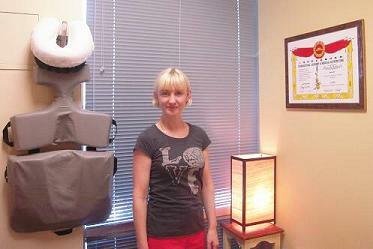 When I saw her for the regular session she did not have any headache or neck pain. Her vision appeared normal and she had tears in her eyes when she thanked me. It is now almost two months since the last medical massage treatment and I see her monthly to maintain her health with an hour of Swedish massage.